Founders Taylor and Jo Brown are avid outdoor enthusiasts with a love for travel and learning. A few years after landing in Juneau, we thought visitors needed an option to explore everything that this beautiful city has to offer, at their own pace, and in an intimate setting. 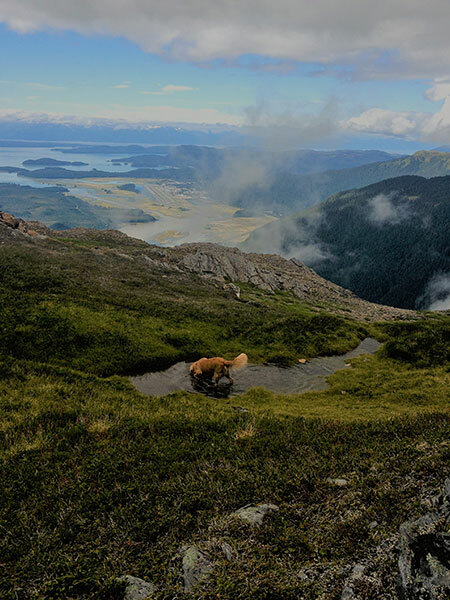 Our love for the history, culture, and the valuable ecosystem led to development of Juneau tours, a customized audio and visual guide that only shares information on locations that are of interest to you, while also providing a background on the whales, bears, eagles, and history of the area..
We can’t imagine a more fun way to experience Southeast Alaska than in an open air Jeep Wrangler. Our entire fleet of Wranglers come with easy lift soft tops, allowing you to take in the fresh mountain air or quickly take cover from the rain. Our staff is happy to setup your Jeep prior to your Juneau tour with the top up or down, and instruct you on how to lift or secure it along your journey. We want your day in Juneau to be packed full of fun and pictures, which is why we selected our home base directly across from the central terminal, Dock C. We know things sometimes don’t come together until the last minute, however we’ve designed our reservation system to be seamless so you will only need to show your drivers license upon arrival to be on your way. If you can reserve a vehicle for your Juneau tour online, it’s strongly encouraged. Our website includes a tutorial on the guide, so you can be familiar with it and hit the road upon arrival.